The joys of the lovely La Paz! 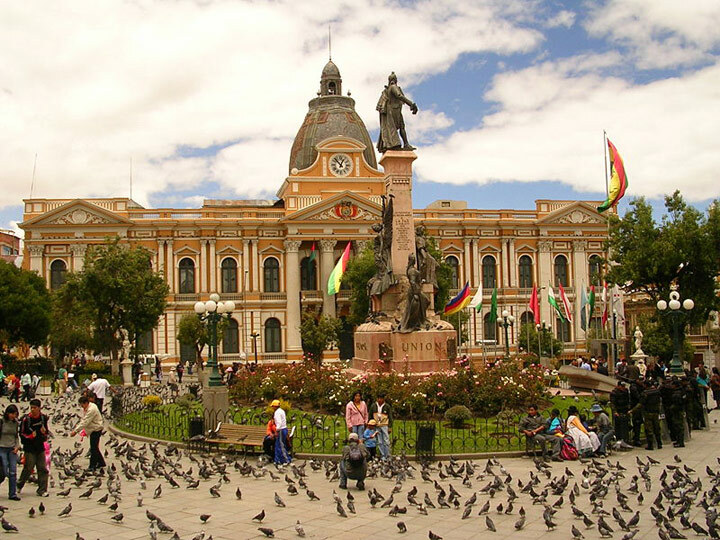 Our final Bolivian destination (sort of) was La Paz. An incredible city with lots to offer, and a place famous for 'sucking you in'. We most certainly got 'sucked in'. The hostel Wild Rover. A most fantastic Irish hostel, probably the most sociable place we've stayed. Its cheap (at least a room for a night is cheap, more on this later), very clean and has everything a traveller could possibly require, including a fabulous bar to party at. Being there for St Patricks Day was incredible, and weirdly is the most I've ever celebrated it, topped off by being able to watch England defeat the luck of the irish in the six nations. Amazing. Death Road! Having won our hostel's pub quiz the evening before, we donned our prize t'shirts (awful and I tried to convince them otherwise but I was outnumbered) and set off for the top of Death road with our guides Danny and Salmon (Solomon). Having all declared ourselves to have bajo (poor) fitness on our registration forms, we all fully lived up to our team name (Team Bajo), with Charlie barely able to make it to the Cafe for pre-cycling breakfast, and Cara making minimal effort to hide her lack of enjoyment of the day in general. Gus (August, Goofy) made an early dive over his handle bars much to the disapproval of our guides, 'dont fall off again please'. And Charlie followed at the end by managing to cycle over herself. We made it down alive though and had an incredible day (Cara aside obviously) enjoying amazing scenery. The Amazon! From La Paz we (Gareth and I) flew to Rurrenabaque to do a 'Pampas Tour' in the Amazon. Flying into the Amazon is absolutely breathtaking. The size of it, and the river snaking through the middle is incredible to see. We started our tour with Indigena with our fellows tourists Chao (a break-dancing, unicycling japanese guy) and his partner, Mathieu and Diego and our guide Choco! On our first day on the boat we saw an unbelievable amount of wildlife: pink dolphins, turtles, howler monkeys (red, brown and black), squirrel monkeys, cappucino monkeys, blue and scarlet macaws, herons, tiger herons, cormorants, tucans and lots more birds that I cant remeber to list here. Its just phenomenal and although many people are doing the same tour at once, they manage to make it feel as though you are not just one of many. The rest of the trip included the following amazing things: two amazing sunsets; staying at nights in a floating lodge with hammock rooms; an amazing cook who provided the most incredible meals; anaconda hunting (and finding one which is apparently very rare!) also seeing a green mamba, a rattle snake and a tarantula; piranha fishing; aligator eyes on the river at night lighting up; swiming with pink dolphins. All in all an incredible trip, something anyone HAS to do if they are going to South America. The Witches Market So Bolivia is weird and this is highlighted by a trip to the witches market, where they sell llama foetus'. We're not entirely sure why but have been told it is for locals to put underneath their new houses for good luck. Its very creepy to look at though all hanging in a line. Gross. The start of the novelty t-shirts. As previously mentioned, we started to collect as a group free t shirts for numerous events/activities. Why I wsa the only person to see wearing them as a 'team' I will never know. But it did contribute to the creation of Bajo so I'll forgivfe them all slightly. The fly killing incident..... On our way back up from Death Road Gareth decided to kill a fly by punching, (Gareth insists we point out here he used the side of his fist and not the front, although why it matters I dont know) the window of our van. Predictably, the glass smashed and fell onto Gareth's leg. Somehow, as the fly did die he is still classing this as a win.....men. The delayed flight to Rurrenabaque (for the Amazon)! Our flight was delayed and it did feel like we were waiting forever without news in the departures lounge. However, my wait was made much easier by watching Gareth get progressively more angry and impatient whilst the Bolivians did nothing to cure his rage. Once in the Amazon, and safely at our lodge, the staff showed us a rope swing into the river, not ten feet away from their alligator friend. We were assured he is very friendly, I wasnt convinced! Catching some magnificent weeds but nto alot else as a group to watch Choco (the guide) catch fifteen. So embarrassing! The generator running out whilst I was in the shower and having to scream for Gareth´s help in the dark. The bugs in the jungle were HUGE, in my defence. The sudden down pour whilst on the boat on uor way back to the cars at the end of the tour. Stronger than any shower I've ever been in and made sure we were all soaked through and through! The Spanish man who got off the plane we were waiting for and decided it was necessary to put a video camera in my face and interview me in Spanish. I didnt know what he was saying but he seemed happy when I spoke. It was very early, I had not had my cereal, he wasnt doing it to anyone else, I was not impressed! So with an eventful city over and done with, we moved on to Lake Titicaca with Courtney and Nick to recover! Dad Sounds amazing Maddie, especially the Amazon and a great bunch of companions! A mavellous blog and we look forward to hearing more about it on your return!